We offer cheap international flights outbound from China to Sweden and cheap hotels in Sweden, build your trip with us and save money. The capital and largest city in Sweden is Stockholm, a major commercial, manufacturing, financial, transportation and cultural center. Located on the eastern coast of Sweden, where Lake Malaren joins the Baltic Sea, Stockholm is situated on approximately 20 islands. With its many waterways and parklands, Stockholm with its beauty is often called the ?°Venice of the North?± or ?°the city that floats. ?± Adding to the beauty of the city are the colorful structures. There are block and glass buildings next to dark stone buildings, which punctuate the skyline along with the ancient red-washed houses, onion domes, painted roofs, curved gables and persimmon-based cathedrals and spires. The region has been inhabited for many centuries, but it wasn? ?t until the middle of the 13th century that Stockholm became established. It developed as a commercial center and was under the rule of Denmark. In the 16th century, Danish rule was overthrown and Gustav I Vasa become king of Sweden with Stockholm at the center. Among the most popular attractions in the city is the Vasa Museet (Vasa Museum). This museum was inaugurated in 1990 and is easily the most visited museum in all of Scandinavia. The Vasa, the only 17th century ship remaining intact, stands in the large shiphall. Several exhibitions, a shop, a restaurant and cinemas surround the ship that looks just as it would have when sitting in the harbor during the winter months. Another outstanding site to visit is the Skansen Open-Air Museum that is home to some 150 cultural history buildings from different parts of Sweden. These buildings represent different periods and social conditions stretching from the Middle Ages into the 20th century. Covering a large area, living crafts and various occupations can be seen here. Located between Stockholm and Uppsala is Skokloster Castle, which was built between 1654 and 1676 by Count Carl Gustaf Wrangel. In 1967 the Castle was sold to the Swedish government. On display we find art (including applied art), textiles, furniture, books and weapons. The Swedish Museum of Natural History features 18 million objects of zoological, botanical, paleontological and geological collections. Part of the Museum is Cosmonova, the only omnimax cinema in Sweden and the largest planetarium in the country. The screen is built in the form of a dome and the films shown here are formatted as the largest in the world. City Hall, which is also the City Museum of Stockholm, was built in 1685. It became a museum in the 1930s and is the cultural history authority of the urban district. More than 300,000 paintings, drawings and other incidentals relevant to Stockholm can be found on microfilm in the Information Room. Stockholm is set at the point where the waters of Malaren (Lake Malar) rush into the Baltic, Stockholm is one of Europe? ?s most beautiful capitals. Nearly 1.5 million people live in the greater Stockholm area, yet it remains a quiet, almost pastoral city. Built on 14 small islands among open bays and narrow channels, the city is handsome and civilized. It is filled with parks that cover nearly a third of the entire city, and with squares and airy boulevards, yet it? ?s also a bustling metropolis. Glass and steel skyscrapers abound but you are never more than five minutes walk from twisting medieval streets and waterside promenades. The city enjoys a bustling street life with a high density of restaurants, a thriving caf¨? 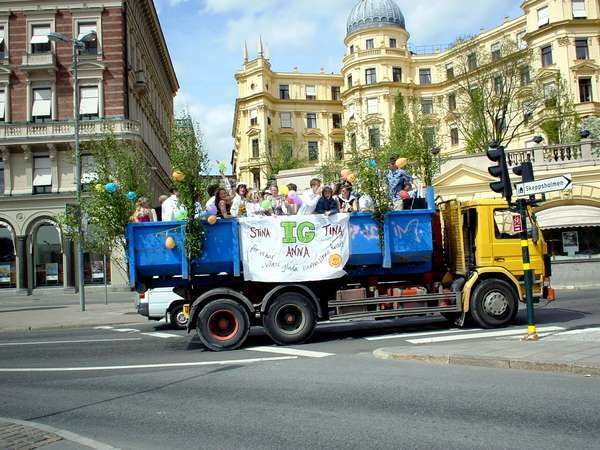 society and free entertainment in parks and gardens that contribute to an exciting and colorful outdoor life in the summer. 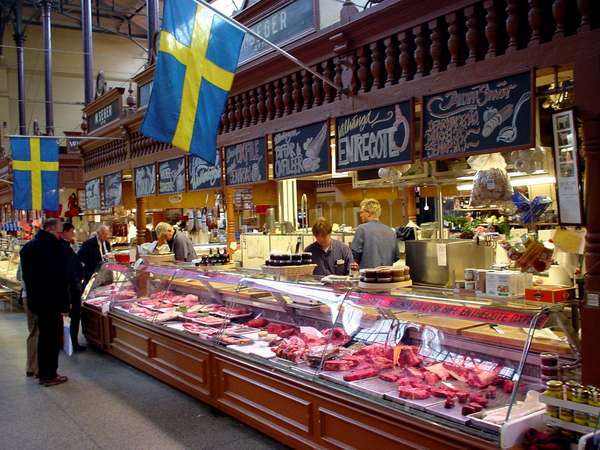 Stockholm is also rich in cultural activities, with a wide selection of museums, theaters, art galleries and churches. 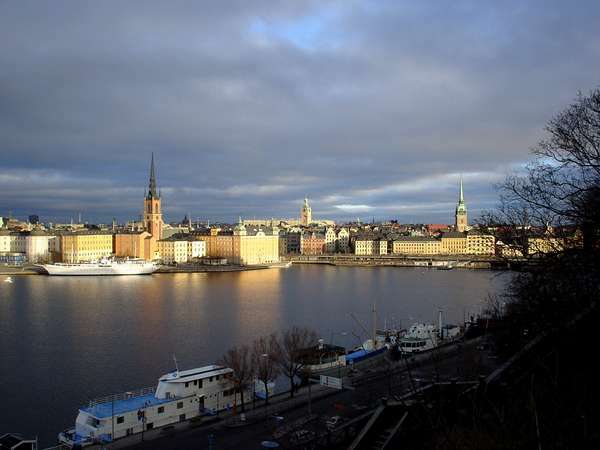 Gamla Stan, situated on the island of Stadsholmen, is Stockholm? ?s old medieval town that emerged in the 13th century. Gamla Stan is home to the present Royal Palace, where apartments and an armory offer an excellent insight into the past. A ceremonial changing of the guard takes place at noon on weekdays. The oldest city wall (1250), a simple stone wall which gave the city its characteristic shape of a heart, can also be seen there. Stortorget is Stockholm? ?s oldest center. This great square, on the highest point of the island, was a noisy place of trade in medieval times and was the place of execution. 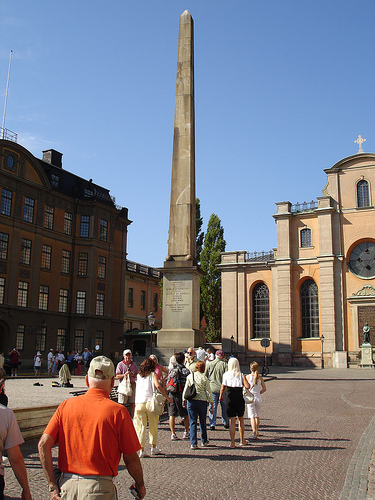 It was the site of a most dreadful event, the Stockholm Bloodbath, when about 90 people were beheaded or hanged. The large building, in late rococo style, is the stock exchange and is also where the members of the Swedish Academy meet. The Academy was founded in 1786 and it? ?s from there that the name of the Nobel Prize Laureate for Literature is revealed to the international press. Riddarholm Church is one of the oldest buildings in Stockholm. Now a museum, it ranks as one of the best-preserved Franciscan churches in northern Europe. East of the city, the larger island of Djurgarden offers wonderful parklands and a concentration of fine museums. On the western shore of Djurgarden is the famous Vasamuseet, which grants you a look into the lives of 17th century sailors and is a brilliant achievement in marine archaeology.